The first part of this post is written by Erin (edited a bit by me) who is a sweet sister in the faith and friend of mine. Be blessed by her story! 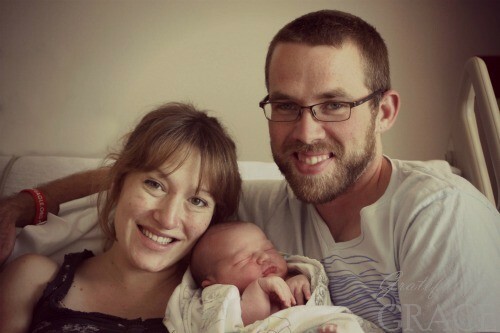 At the end is a brief interview about details of her family centered c-section experience. While Erin’s journey to this type of birth is not typical, any woman who would like more of a birth experience in the operating room would benefit from this post. My first child was born on October 18, 2010. By the grace of God, our daughter was revived but she had no brain activity and her organs were shutting down. After many blurry, confusing and heartbreaking hours, we decided to give the order to DNR if her heart crashed again. Thirty-six hours after she was born, our daughter Gwendolyn Hope fell asleep in the Lord. Our journey through the shock and grief of losing our perfectly formed baby girl is a long story (though a good one, in my opinion.) The Lord proved himself faithful to “bind up the brokenhearted” and by the time our daughter’s first birthday arrived, we were able to rejoice in her Heavenly Home, our confident hope that we WILL see her again, and the compassion of the Lord through the presence of His Church. The Lord had also blessed us with a new pregnancy with a scheduled due date of April 27, 2012. I would be lying if I told you this pregnancy was anxiety-free. The idea that I could be again told to “not expect my baby to be alive”, that I could be rushed to a surgery and put under anesthesia, that I could be separated from my husband during the worst experience of my life deeply scared me. 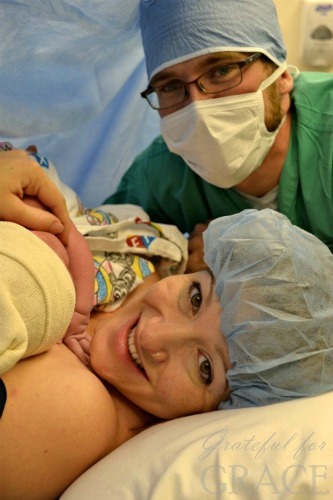 My husband, Blair, and I decided to have a scheduled c-section to avoid the possibility of enduring an emergency cesarean. Blair found a video that depicted a “family centered cesarean”: a revolutionary idea on how to make a sterile, impersonal surgery revolve around the family unit and begin the bonding process with baby and mom immediately. As I watched the video, I sat in awe thinking that maybe, just maybe, I could have that kind of a birth. With a lump in my throat, I sent the link to Mindy asking her, “Do you even think this would be possible at PRMC? ?” She encouraged me to try; so try we did. Blair and I decided we would ask our doctor and the head of the hospital to view the video and consider giving us this kind of a birth. Unbeknownst to me, Mindy had passed the video on to a midwife, Niessa, in the same practice as my doctor, who then did an amazing job of lobbying for us. 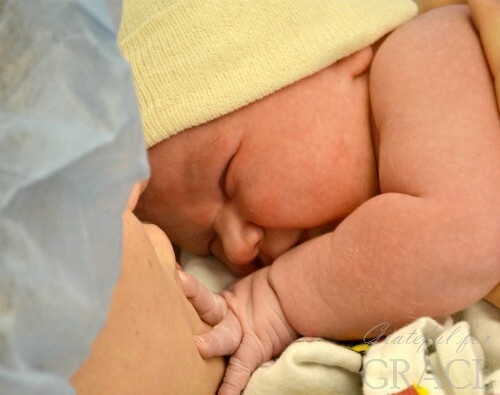 When Blair and I had our 34 week appointment, our doctor surprised us by bringing up the family centered cesarean then we were shocked by the eager excitement of the staff at the hospital to try this different cesarean. Where previously I had dreaded the surgery, I now was excited to think that it could be what we wanted: a birth experience. The unique aspects of a family centered cesarean include having the curtain dropped so the mom and dad can see the baby as he or she emerges, having skin to skin contact with mom right away, letting the dad cut the umbilical cord, and having the baby stay with you the whole time – all the newborn checkups would be done at the mother’s chest. It only took a few short moments for them to have me prepped for surgery, and while Blair and I were praying, the doctors had already made the first incision. It was only a few moments before they dropped the curtain, and I saw my beautiful baby pulled from my womb. It was a boy! Both Blair and I were crying as he was handed to me, very much alive, warm, and screaming. You would have had to experience the silence of a dying baby to understand how indescribable it was to hear my son, and feel his arms and legs flailing about. I did get slightly nauseated in the surgery, which is very normal. Malacai had already been born and was sitting on my chest, so they transferred him over to Blair until I was ready to hold him again. It was so precious, seeing my husband hold his baby boy. It only took a half hour or so for them to sew me back up and as a family we left the operating room. How did it feel, both physically and emotionally, to watch your son come out? I started crying the minute I could see his head. To see him squirm and hear him scream was the most beautiful thing I’ve ever experienced. Physically, I couldn’t feel a thing – there was so much happening at once, and I was so excited and anxious to see him that I didn’t even notice them pushing on my uterus. How did it feel, both physically and emotionally, to have him on your chest while they sewed you up? I honestly can’t imagine having him anywhere else. The fact that so many moms are not able to hold their child after a c-section is horrendous to me. It just seems like the natural thing to do – of course he should be with me. I think if he hadn’t been, there would’ve been a bit of an emotional drop in excitement. It was a challenge physically to hold him, since I was numb from the anesthesia up to my chest, but I didn’t mind at all. The only painful sensation I had during the whole process was the numbing shots they gave me in my spine BEFORE they put in the spinal block, and those were more of a “regular shot” type pain anyway. It was a bit weird, feeling my whole body go numb, and trying to move my toes when they couldn’t. But not painful. No. This is one of the major benefits to a family centered cesarean, and one that the Anesthesiologist was amazed by. Because of the rush of endorphins from seeing the baby and having skin to skin contact right away, there was no need for additional medication to supplement for the typical drop in hormones leading to depression or anxiety. I think our Anesthesiologist was amazed by how such a simple “fix” in the process of a cesarean can alter your biochemical reactions and remove any need for additional drugs! Coming soon: a doctor’s, a midwife’s and a head nurse’s perspective of the family centered c-section! Spread the news so other women can be blessed by this alternative kind of c-section! Doesn’t this kind of c-section sound precious?